This salad is AMAZING. 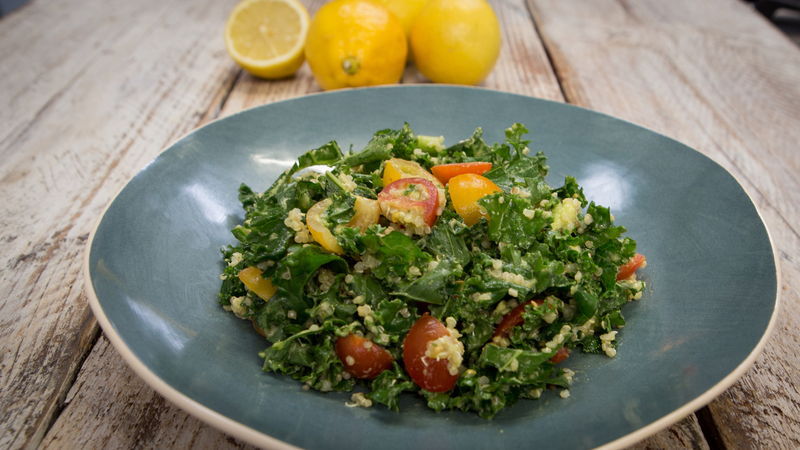 Creamy avocado, sweet tomato, and tangy lemon cling to the kale, which soften from all the flavors. Quinoa also soaks up the flavors, and makes this hearty enough to eat as a meal. 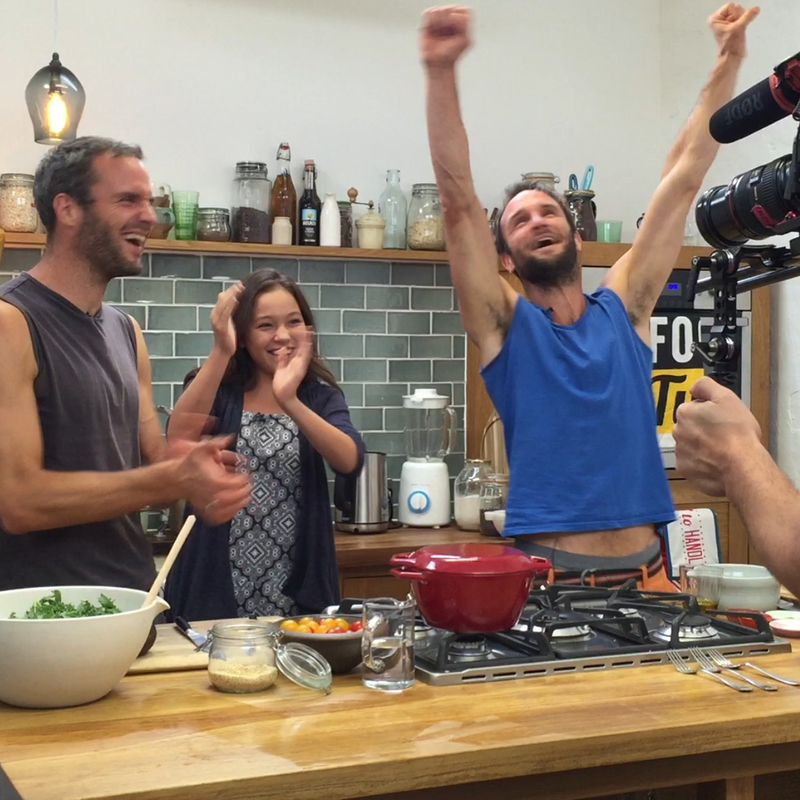 I made this with Stephen and David – The Happy Pear – who have dedicated their lives to sharing healthy, delicious food. Thank you Stephen and David, it was so much fun to hang out with you! 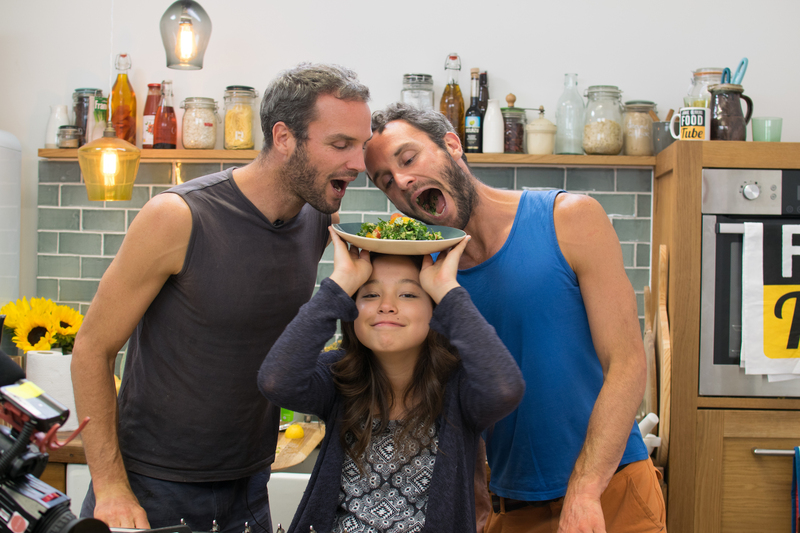 Be sure to check out our other video, Asian Broccoli Salad! Many people assume that kale tastes bad or boring because it’s one of the healthiest foods on the planet. I’m going to prove them all wrong! This salad is amazing. 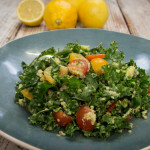 Creamy avocado, sweet tomato, and tangy lemon cling to the kale, which softens from all the juices. The kale and quinoa also soak up the flavors and make this hearty enough to eat as a main meal. Also, can we take a moment to appreciate all the colors? Rinse the quinoa and combine it with the stock in a pot. Bring to a boil, lower the heat to low, cover, and simmer until the quinoa is tender, about 15 minutes. Turn off the heat and let sit for 5 minutes. Meanwhile, to make the dressing, combine the lemon juice, mustard, and nutritional yeast in a bowl. Slowly drizzle in the oil while whisking to emulsify the dressing and make it creamy. Add salt and pepper to taste. Wash and stem the kale. You can do this by holding the stem with one hand and running the other hand down the stem from base to tip, ripping off the leaf in the process. Tear into bite-size pieces and place in a large bowl. Once the quinoa has cooled enough to handle, add it to the kale. Pour half of the dressing over the kale salad and mix to coat, using clean hands or two wooden spoons. Add more dressing as needed. Peel and pit the avocado and cut into bite-size pieces. Halve the tomatoes. 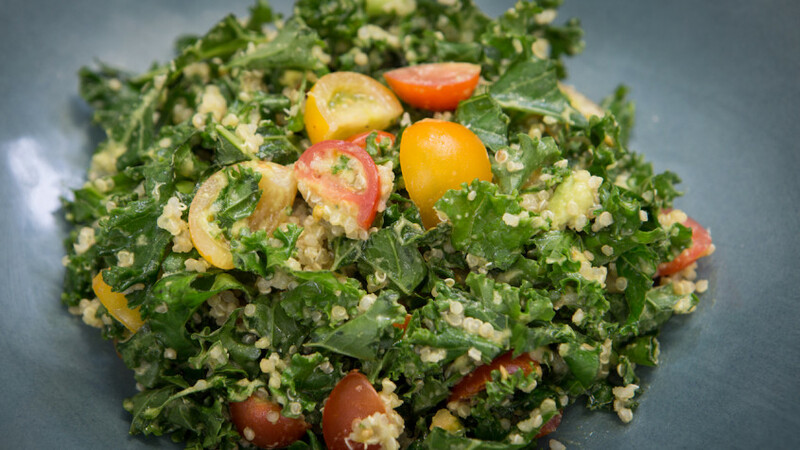 Reserve some of the tomatoes for garnish, and carefully fold the rest along with the avocado in with the kale and quinoa. Pile the salad onto a large serving platter and top with the reserved tomatoes. Pack any leftover quinoa salad in a container and keep it in the fridge. The next day, grab the quinoa salad, a fork, and a napkin, and you are good to go! Me and my mom made your salad,and it was delicious! Next time we will add more lemon,though. We are looking forward to making more of your recipes!